- Made from durable and practical material which provides a longer lifespan. 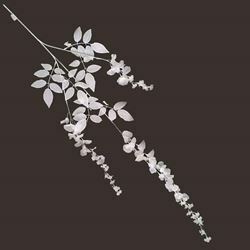 - A bunch of weeping leaves contains variable branches of length - The overall length is 80-100cm, while the length of shortest branches ranges from 20-45cm. - The artificial plant stem is of high simulation, the texture is good to feel. - Waterproof as well as sun proof, a perfect floral decor for indoor and outdoor decoration.